UNCG student organizations UNCGreen and the Campus Activities Board have teamed up to host the 2016 Earth Day Celebration on Friday, April 22, from 3 to 8 p.m. on College Avenue. The event, which is free and open to the public, features free food and Ben & Jerry’s ice cream, games, giveaways and live music by students. UNCGreen, the UNCG Green Fund and other campus organizations will be on site to share information about sustainability projects and practices. The event will be held rain or shine, and the musical performances will take place under a large tent. UNCGreen and UNCG Grounds will kick off the celebration by planting a tree between the Elliott University Center and Moran Commons and Plaza at 1 p.m.
“This is a fun opportunity to learn about, connect with and celebrate the natural environment that we interact with on a daily basis,” said Dr. Shanna Eller, sustainability coordinator for operations at UNCG. UNCG has established itself as a leader in sustainability across the state with projects like the installation of a 2,500-gallon cistern and the longtime Sustainability Film & Discussion Series, as well as the Environmental & Sustainability Studies Program. 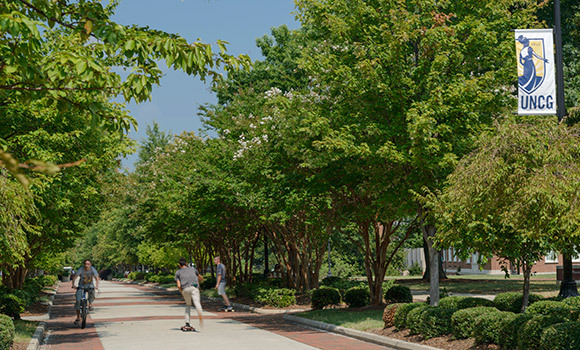 Additionally, UNCG is one of just four universities in the state to achieve a Gold rating from the Sustainability Tracking, Assessment & Rating System (STARS). UNC Chapel Hill, NC State and Appalachian State also have received Gold ratings. Just last year, UNCG’s Student Fees Committee voted to implement a $2.22 annual fee per student to raise funds for sustainability projects across campus and the community. This student-led initiative now known as the Green Fund announced its first round of funded projects earlier this semester and provided funding for the Earth Day Celebration. For more information about sustainability initiatives at UNCG, visit facsustainability.uncg.edu.